Personalise your room with a beautiful floral initial made from paper blossoms! Use a variety of colours and sizes of flower to create dimension as you layer them on your MDF letter. You can create lots of these to spell out a word or a name, or you can create a single chic monogram for your desk or home. You can watch our video tutorial for this craft here! 2. Take a selection of green paper blossoms and your choice of coloured blossoms – you can use as many colours as you wish but we used a selection to add depth. Tear the green blossoms to create leaves. 3. Adhere the flowers to your MDF shape, layering them how you’d like. Make sure that any flowers at the bottom of the MDF letter sit flush to the bottom of the shape – if they overlap, the letter might not be able to stand. 4. Using gold glitter glue, decorate the petals of your flowers if you wish. 5. Add gems to the centre of your flower blossoms to decorate. You now have your finished Floral Monogram letter, ready to display. Why not go one step further and adhere your letter to a frame with pretty backing paper? You could decorate the frame too and create a pretty wall art design! 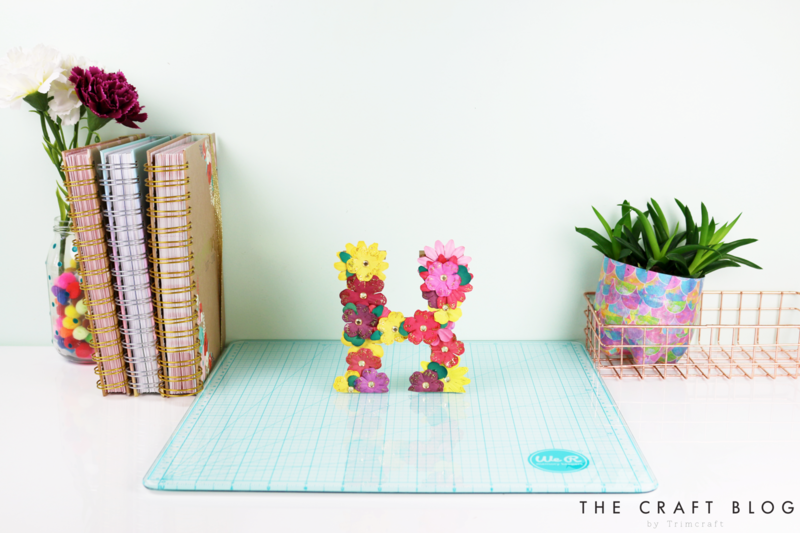 Will you be creating your own Floral Letter? We’d love to see if you do, so don’t forget to #Trimcraft when uploading to social media and to share your projects in the Inspiration area.